England has been in the midst of a civil war for nearly ten years. The country has been torn in two, and the King is getting ready to make his last stand against Cromwell’s New Model Army. Abigail Chaplin, a young deaf girl, has lost her father to the parliamentarian cause. But with her family now in reduced circumstances, she is forced to work as a servant at a royalist household - the estate of Lady Katherine Fanshawe. Abi is soon caught up in a web of sinister secrets which surround the Fanshawe estate. The most curious of which is the disappearance of Lady Katherine late at night. Why are her husband’s clothes worn and muddy even though he hasn’t been home for weeks? How is she stealing out of the house late at night when her room is being guarded? And what is her involvement with the robberies being committed by the mysterious Silent Highwayman? 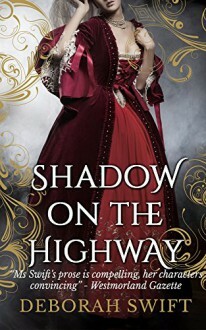 ‘Shadow On The Highway’ is based on the life and legend of Lady Katherine Fanshawe, the highwaywoman, sometimes known as ‘The Wicked Lady’. It is the first book in ‘The Highway Trilogy’. Deborah Swift lives in North Lancashire on the edge of the Lake District. She teaches classes and courses in writing, and is the author of three other historical novels: ‘The Lady’s Slipper’, ‘The Gilded Lily’ and ‘A Divided Inheritance’. You can find out more about her on her website, www.deborahswift.co.uk. Endeavour Press is the UK's leading independent publisher of digital books.